Wax Breaker: Just when I think I'm out, they drag me back in. I stumbled upon some extra cash today so I made a trip down to my favorite hobby shop. As I looked around I randomly grabbed some Topps 08, an M&M pack to see if I could help J.C.F. with his Tulo collection, and to top it all off I decided to see if I could grab a good auto or two out of some finest minis. Every pack paid off...even the finest which I have been bashing on recently. The Topps '08 had a gold parallel that I didn't have yet. This card brings my total up to 72 of the gold numbered parallels. If I havn't mentioned previously, I'm trying to put together the entire numbered gold parallel set from Topps 08. So far things are looking good. The Moments and Milestones pack had a Tulo as the first card in the pack. To finish it all i opened my finest packs. I picked them totally at random out of the 12 minis available. The 2 that I picked had some great cards for my collection. A Frank Thomas base card wooohoo didn't have that one yet, a Joba base card that looks exactly like his bowman prospects card, and a grip of Rockies. 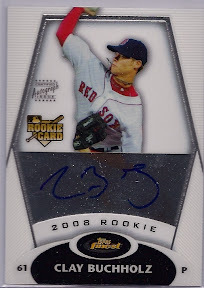 The first auto was one of my best ever a Clay Buchholz rookie auto. I have liked the kid since I started collecting. I think he has a lot of potential to be a full time stud for the bosox. THE SECOND AUTO. 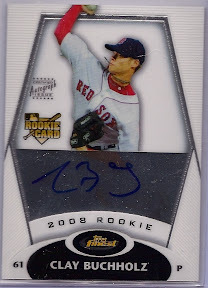 . . hmmm thats weird ANOTHER CLAY BUCHHOLZ ROOKIE AUTO. How weird but how nice when you think about how much these cards could be worth in the future. Hopefully the odds of getting this auto are high and I just got really lucky. I'm sure however that its the other way around.